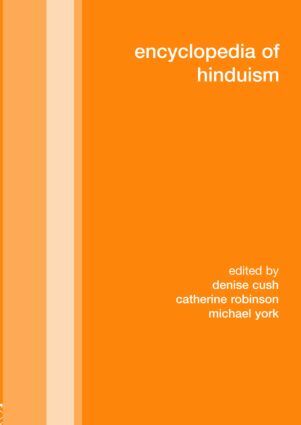 The Encyclopedia of Hinduism contains over 900 entries reflecting recent advances in scholarship which have raised new theoretical and methodological issues as well as identifying new areas of study which have not been addressed previously. The debate over the term 'Hinduism' in the light of post-Orientalist critiques is just one example of how once standard academic frameworks have been called into question. Entries range from 150-word definitions of terms and concepts to 5,000-word in-depth investigations of major topics. The Encyclopedia covers all aspects of Hinduism but departs from other works in including more ethnographic and contemporary material in contrast to an exclusively textual and historical approach. It includes a broad range of subject matter such as: historical developments (among them nineteenth and twentieth century reform and revival); geographical distribution (especially the diaspora); major and minor movements; philosophies and theologies; scriptures; deities; temples and sacred sites; pilgrimages; festivals; rites of passage; worship; religious arts (sculpture, architecture, music, dance, etc. ); religious sciences (e.g. astrology); biographies of leading figures; local and regional traditions; caste and untouchability; feminism and women's religion; nationalism and the Hindu radical right; and new religious movements. The history of study and the role of important scholars past and present are also discussed. Accessibility to all levels of reader has been a priority and no previous knowledge is assumed. However, the in-depth larger entries and the design of the work in line with the latest scholarly advances means that the volume will be of considerable interest to specialists. The whole is cross-referenced and bibliographies attach to the larger entries. There is a full index.